Betadine is the brand name of a product that usually comes as a brown colored liquid substance that consists of povidone and iodine. Povidone (polyvinylpyrrolidone) is a polymer that is bonded with the iodine that is present in the substance. The amount of iodine that is present in the solution usually varies from about 9 to 12%. The molecular formula of povidone-iodine is C6H9I2NO, and the molecular weight is 364.953 g/mol. This is a synthetic substance that was created by combining different substances. Betadine is used as a skin antiseptic ointment. It is applied topically and is used to kill bacteria, fungi, and viruses that may be present on the skin. It is used by people to clean wounds before applying a dressing and also is used to clean the skin before a surgical procedure begins. Betadine can be used to clean any wounds before applying a gauze dressing or bandage. The Betadine should be stored at cool temperatures, below 25 degrees Celsius, and it usually lasts about 2 years. Povidone-iodine does not actually exist in nature but has been synthetically created. Small quantities of Betadine can be purchased over the counter at a chemist without a prescription. Larger quantities are found in hospitals where it is often used to clean skin before surgical procedures are performed. The Betadine has minimal toxic effects on people because the povidone ensures that the iodine is only released slowly, which means that it is actually less harmful than iodine used by itself. The presence of the povidone actually minimizes staining, and it reduces any irritability reactions that may occur with iodine used alone. Irritation to the skin usually only occurs in very rare cases, sometimes for instance, when it is used over large regions of the body as in the case of burn patients. Iodine is one of the chemical elements that is found in the periodic table of elements. It is one of the elements that is known as a halogen or non-metallic element. The symbol for iodine is the letter I, and the atomic number is 53. The molecular formula is I2 and the molecular weight is 253.809 g/mol. Iodine is a substance that the human body actually needs in order for the thyroid to work properly. The thyroid gland uses iodine to form thyroid hormones which control the metabolism of the body. Iodine is used in nuclear medicine and for treating certain types of cancer. The isotope of iodine, iodine-131 is very useful. It is used in fact to determine how the thyroid gland is working and to treat cancer of the thyroid. It is also used to find tumors of the liver and brain. Iodine is fairly rare in nature but there are good sources of it in certain food types such as in seaweeds and fish such as cod and tuna. It is important to remember that our bodies require iodine for the formation of thyroid hormones by the thyroid gland. Iodine usually combines with other substances in nature. At room temperatures, iodine can release toxic vapors, and inhaling vapors of iodine can result in muscle weakness and coma. 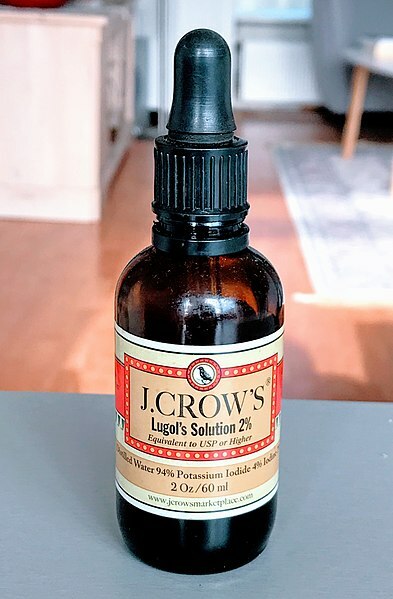 It is generally not available in large enough amounts to be toxic, but if it were to be ingested it would cause some gastrointestinal irritation. Difference between Betadine and Iodine? Betadine is a substance that contains both iodine and a polymer known as povidone. Iodine is an actual chemical element, a halogen. The molecular formula for Betadine is C6H9I2NO, while the formula for iodine is I2. The molecular weight of Betadine is 364.953 g/mol and the molecular weight of iodine is 253.809 g/mol. 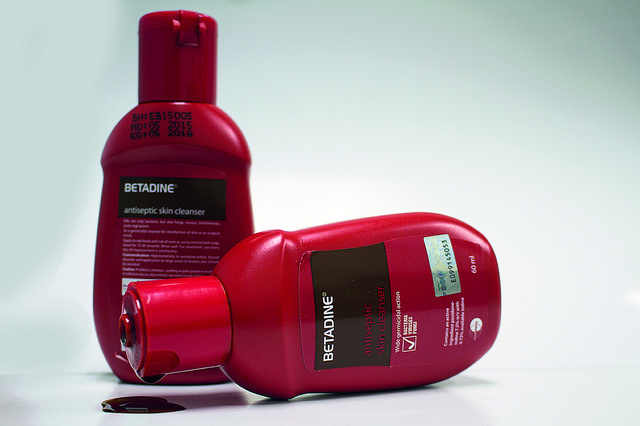 Betadine is used as an antiseptic for skin and wounds. Iodine is used by the thyroid gland to form hormones, and iodine is used in nuclear medicine and in radiation therapy to treat cancer. Betadine is not found in nature; it is available as an over the counter medicine at a chemist. It is also readily available in hospital settings. Iodine is quite rare in nature and often is found combined with other substances. It can be found in certain foods such as seaweeds, and fish species such as tuna and cod. The Betadine has minimal toxicity since it is complexed with povidone. It can in very rare instances cause some skin irritation. Iodine is more toxic especially if breathed in or taken internally. Iodine vapors can cause irritation to the eyes, nose, and lungs and can lead to coma. If iodine is ingested it can cause problems with the gastrointestinal system. Betadine contains iodine, but also contains povidone which is a polymer. Both Betadine and iodine are useful in medicine. Betadine is an antiseptic used to treat wounds and is used as a surgical scrub. Iodine can be used in nuclear medicine and can also be used to treat certain conditions such as thyroid cancer. It is important to take in enough iodine for your thyroid gland to function correctly since your thyroid hormones are made from iodine. Betadine is of low toxicity because the iodine is combined with the povidone to ensure only a slow release of iodine to minimize skin irritation. Dr. Rae Osborn. 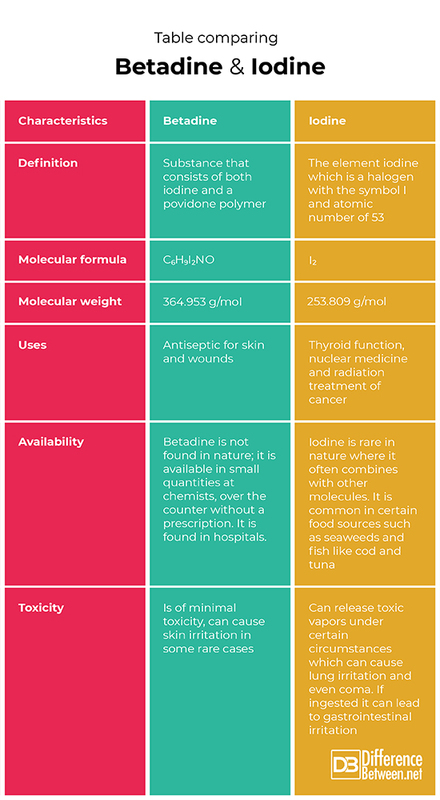 "Difference Between Betadine and Iodine." DifferenceBetween.net. November 16, 2018 < http://www.differencebetween.net/science/difference-between-betadine-and-iodine/ >. Rodeheaver, George, et al. "Bactericidal activity and toxicity of iodine-containing solutions in wounds." Archives of surgery 117.2 (1982): 181-186.